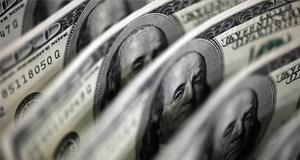 FOREX: The dollar index is down by 0.10% on Thursday after ending the previous session practically unchanged, failing to capitalize on a sustained surge in longer-term US bond yields. In the UK, the British pound had a turbulent ride amid Brexit news. Meanwhile, commodity-linked currencies such as the loonie, aussie, and kiwi staged a quiet comeback as worries over global trade eased. STOCKS: It was a mixed session in the US on Wednesday. The Dow Jones (+0.61%) and the S&P 500 (+0.13%) grinded higher as trade concerns took a back seat, both coming within breathing distance of their respective all-time highs. However, the tech-heavy Nasdaq Composite closed slightly lower (-0.07%), dragged down by news that EU regulators plan to launch an antitrust investigation into Amazon (-0.75%). Meanwhile, Asia was mostly higher on Thursday, albeit not by much. In Japan, the Nikkei 225 (+0.01%) and the Topix (+0.11%) barely ticked up, as did the Hang Seng in Hong Kong (+0.06%). Meanwhile in Europe, investors seem to be more upbeat, as all the major benchmarks are set for a higher open today according to futures. COMMODITIES: Oil continued to rally, boosted by a larger-than-anticipated drawdown in the weekly EIA crude inventories yesterday, as well as continued speculation that major OPEC producers like Saudi Arabia may hold off from raising their production. WTI is up by 0.57% on Thursday at $71.58 per barrel, while Brent is higher by 0.28% at $79.61 a barrel. In precious metals, gold is trading up by 0.10% today at $1,204 an ounce, looking to extend its modest gains from yesterday. The outlook for the yellow metal remains neutral in the short-run, with a break either above $1,214 or below $1,189 – the commodity’s recent range – needed to determine the next directional wave. There was little movement in the dollar on Wednesday. 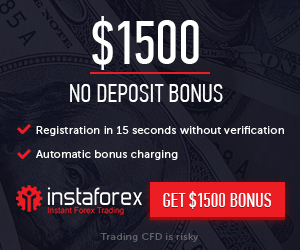 The US currency closed the session practically flat against a basket of six major currencies, failing to draw strength from another surge in 10-year US bond yields, which touched a fresh four-month high and are now not far below levels last seen in 2011. Higher sovereign yields are usually considered positive for a currency, as the higher returns typically lure in foreign investors searching for yield. Stocks are also worth keeping an eye on. A sustained rise in US yields could (in theory) divert some funds away from stock markets, as investors rebalance their bond-to-equity exposure in favor of bonds. In the UK, sterling retreated – giving back earlier gains from strong inflation data – after UK press reported PM May rejected the EU’s improved offer on the Irish border issue. This, a few hours before May addressed the EU 27 leaders in Austria to “pitch” her Chequers proposals. The EU summit will be in focus today, with the tone of any comments from the relevant officials likely to impact sterling – even in the absence of real substance. Going forward, the currency’s performance may hinge on whether a realistic and workable proposal for the Irish border is submitted within the next weeks. The Conservative Party conference commencing on September 30 could also deliver fireworks, as Theresa May might have to stave off a leadership challenge. Elsewhere, commodity-linked currencies staged a quiet comeback. The loonie tracked oil prices higher, touching a fresh three-week high against the dollar, with the surge also aided by some optimistic NAFTA remarks from Canada’s Freeland. The aussie and kiwi also rose to three-week peaks against the greenback, recovering some of their spectacular losses in recent months, as concerns over the US-China trade skirmish took a back seat. Kiwi/dollar is also up by 0.5% today, propelled higher by a stronger-than-expected GDP print for Q2 out of New Zealand overnight. In Switzerland, the SNB kept its policy rates unchanged at the lowest level globally earlier today, reiterating the same old mantra that the franc is still “highly valued” and that it will remain active in the FX market. Given the absence of any new policy signals, there was little reaction in the franc. In the short-run, the currency will likely continue to be driven by safe-haven flows. More broadly, since the SNB continues to lag its major peers in signaling normalization, monetary policy divergence argues in favor of a softer franc over time. Thursday’s calendar features retail sales data out of the UK, as well as the Philly Fed Business index and existing home sales out of the US. Meanwhile, Norway’s central bank will be deciding on monetary policy early in the European session, soon after the Swiss National Bank’s respective decision. The Norges Bank is anticipated to raise its key policy rate by 25bps to 0.75%, this constituting the Bank’s first rate increase since 2011. Should the decision be accompanied with a relatively hawkish rate guidance, then krone pairs are expected to appreciate. A press conference will follow after the central bank’s decision. Retail sales for August are due out of the UK at 0830 GMT. Both headline and the core measure of sales that excludes fuel are anticipated to contract by 0.2% m/m in August, after rising by 0.7% and 0.9% in July respectively. Consequently, the annual rates of growth in the two measures are projected at 2.3% and 2.5% correspondingly, notably below July’s numbers. A data beat that would maintain positive momentum from stronger-than-expected inflation figures yesterday could support the pound. The British currency though will probably prove most sensitive to any Brexit developments stemming from the second day of the informal EU summit in Salzburg; the European Council and Commission Presidents Donald Tusk and Jean-Claude Juncker, as well as Austrian Chancellor Sebastian Kurz, will hold a news conference upon completion of the summit at 1300 GMT. 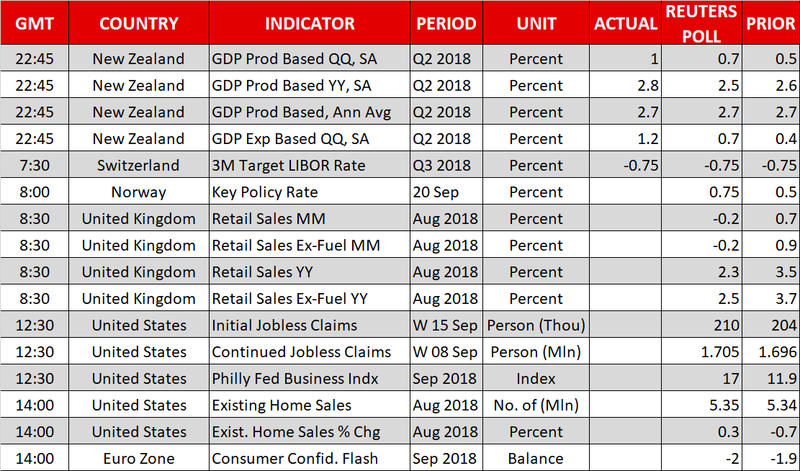 Out of the US, September’s Philly Fed Business index slated for release at 1230 GMT is predicted to show an improvement relative to August; the index has in the past taken a hit on the back of escalating trade tensions and it will be interesting to see whether it will be further weighed by the confrontational trade narrative. Weekly jobless claims data are due at the same time. At 1400 GMT, the world’s largest economy will be on the receiving end of existing home sales for August. Sales are forecast to rise by 0.3% m/m after declining for four straight months; an environment of rising rates is negative for the housing market. Elsewhere, the Fed will be releasing the Quarterly Financial Accounts of the US at 1400 GMT as well. Eurozone flash consumer confidence data for September due at 1400 GMT are expected to show the relevant measure remaining in negative territory for the fourth straight month, slightly deteriorating compared to August’s print. In terms of policymakers’ appearances, Bundesbank chief Jens Weidman, a possible Draghi successor at the helm of the ECB when his term expires in late 2019, will be giving a speech at 1515 GMT. Additionally, ECB chief economist Peter Praet will be talking on “Challenges to monetary policy normalization” at 1720 GMT. Lastly on the trade front, it is positive for sentiment that China does not rule out getting into talks with the US despite the latest exchange of tariff shots; it was previously reported that that outcome would push China away from the negotiating table. In the meantime, talks for a new North American trade agreement between the US and Canada will also be gathering attention. 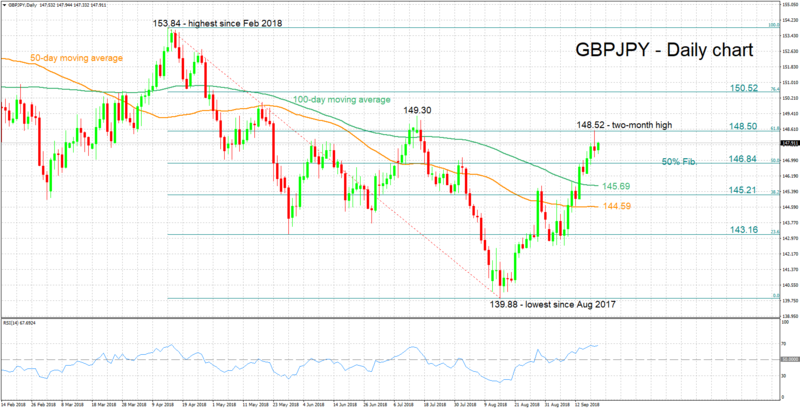 GBPJPY has retreated from Wednesday’s two-month high of 148.52, though it remains bullish in the short-term, having staged a remarkable recovery after falling to a one-year low of 139.88 in mid-August. The rising RSI attests to the bullish near-term view. Notice, though, that the indicator is relatively close to its 70 overbought level. Upbeat UK retail sales data or positive momentum on Brexit are expected to boost GBPJPY. Initial resistance to gains may come around the 61.8% Fibonacci retracement level of the downleg from 153.84 to 139.88 at 148.50; the zone around this captures yesterday’s high of 148.52 as well. Further above, an additional barrier could occur around a previous peak at 149.30. On the downside and in case of negative Brexit developments or weaker-than-forecasted retail sales figures, support may take place around the 50% Fibonacci mark at 146.84. Further below, the area around the current level of the 100-day moving average at 145.69 would be eyed.